Gies, D. R., Bagnuolo, W. G., Jr., and Penny, L. R. 1997, "Photospheric Heating in Colliding Wind Binaries," Astrophysical Journal, 479, 408-415. Cunha, K., Lambert, D. L., Lemke, M., Gies, D. R., and Roberts, L. C. 1997, "Boron Abundances of B Stars of the Orion Association," Astrophysical Journal, 478, 211-224. Kaye, A. B., and Gies, D. R. 1997, "On the Line Profile Variations and Non-Radial Pulsation Modes of Zeta Tauri = HD 37202," Astrophysical Journal, 482, 1028-1037. Gies, D. R., Mason, B. D., Bagnuolo, W. G., Jr., Hahula, M. E., Hartkopf, W. I., McAlister, H. A., Thaller, M. L., McKibben, W. P., and Penny, L. R. 1997, "The O-type Binary 15 Monocerotis Nears Periastron," Astrophysical Journal Letters, 475, L49-L52. Penny, L. R., Gies, D. R., and Bagnuolo, W. G., Jr. 1997, "Tomographic Separation of Composite Spectra. IV. 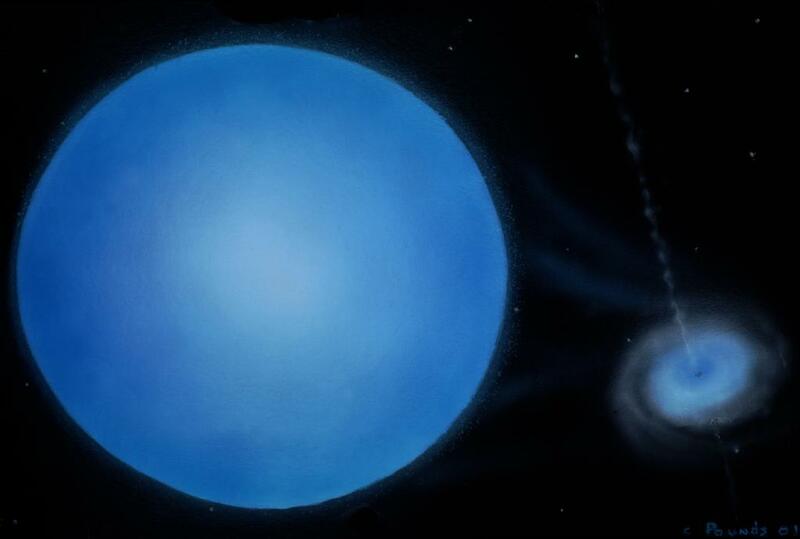 The Physical Properties of the Massive Close Binary DH Cep," Astrophysical Journal, 483, 439-448. Liu, N., Gies, D. R., Riddle, R. L., Xiong, Y., Bagnuolo, W. G., Jr., Barry, D. J., Ferrara, E. C., Hartkopf, W. I., Hooda, J. S., Mason, B. D., McAlister, H. A., Roberts, L. C., Jr., and Sowers, J. W. 1997, "Tomographic Separation of Composite Spectra. V. The Triple Star System 55 UMa," Astrophysical Journal, 485, 350-358. Kaper, L., Henrichs, H. F., Fullerton, A. W., Ando, H., Bjorkman, K. S., Gies, D. R., Hirata, R., Kambe, E., McDavid, D., and Nichols, J. S. 1997, "Coordinated Ultraviolet and H-alpha spectroscopy of Bright O-type Stars," Astronomy and Astrophysics, 327, 281-298. 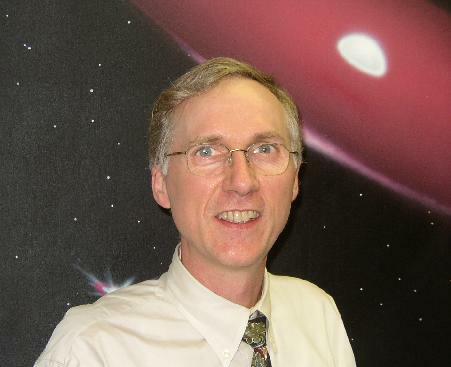 Mason, B. D., ten Brummelaar, T., Gies, D. R., Hartkopf, W. I., and Thaller, M. L. 1997, "ICCD Speckle Observations of Binary Stars. XVIII. An Investigation of Be Stars," Astronomical Journal, 114, 2112-2116. Gies, D. R., Bagnuolo, W. G., Jr., Ferrara, E. C., Kaye, A. B., Thaller, M. L., Penny, L. R., and Peters, G. J. 1998, "HST/GHRS Observations of the Be + sdO Binary Phi Persei," Astrophysical Journal, 493, 440-450. Howarth, I. D., Townsend, R. H. D., Clayton, M. J., Fullerton, A. W., Gies, D. R., Massa, D., Prinja, R. K., and Reid, A. H. N. 1998, "Time-dependent structure in the UV absorption lines of the rapid rotators HD 64760 (B0 Ib) and HD 93521 (O9.5 V)," Monthly Notices of the Royal Astronomical Society, 296, 949-960. Mason, B. D., Gies, D. R., Hartkopf, W. I., Bagnuolo, W. G., Jr., ten Brummelaar, T., and McAlister, H. A. 1998, "ICCD Speckle Observations of Binary Stars. XIX. An Astrometric/Spectroscopic Survey of O Stars," Astronomical Journal, 115, 821-847. Gies, D. R., Shafter, A. W., and Wiggs, M. S. 1998, "H-alpha Spectroscopy of the Unusual Binary V Sagittae," Astronomical Journal, 115, 2566-2570. McKibben, W. P., Bagnuolo, W. G., Jr., Gies, D. R., Hahula, M. E., Hartkopf, W. I., Roberts, L. C., Jr., Bolton, C. T., Fullerton, A. W., Mason, B. D., Penny, L. R., \& Thaller, M. L. 1998, "A Long Period Spectroscopic Binary in the O-Star Multiple System HD 193322," Publications of the Astronomical Society of the Pacific, 110, 900-905. Sowers, J. W., Gies, D. R., Bagnuolo, W. G., Jr., Shafter, A. W., Wiemker, R., and Wiggs, M. S. 1998, "Tomographic Analysis of H-alpha Profiles in HDE 226868/Cygnus X-1," Astrophysical Journal, 506, 424-430. Wang, Z., and Gies, D. R. 1998, "Constraints on the Radial Velocity Curve of HDE 245770 = A 0535+26," Publications of the Astronomical Society of the Pacific, November issue, in press. Gies, D. R., Kambe, E., Josephs, T. S., Bagnuolo, W. G., Jr., Choi, Y. J., Gudehus, D., Guyton, K. M., Hartkopf, W. I., Hildebrand, J. L., Kaye, A. B., Mason, B. D., Riddle, R. L., Sowers, J. W., Turner, N. H., Wilson, J. W., Xiong, Y. 1999, "Ultraviolet and Optical Line Profile Variations in the Spectrum of Epsilon Persei," Astrophysical Journal, in press. The rapid rotator Regulus with the Sun for scale (made by Wenjin Huang). See details in McAlister et al. (2005, astro-ph/0501261). A depiction of SS 433 (made using Rob Hynes BINSIM). See details in Hillwig et al. (2004, ApJ, 615, 422). A movie of SS 433 (made using Rob Hynes BINSIM). See details in Hillwig et al. (2004, ApJ, 615, 422). A movie simulation of beta Lyrae (courtesy of Dave McCarty, Coca-Cola Space Science Center). 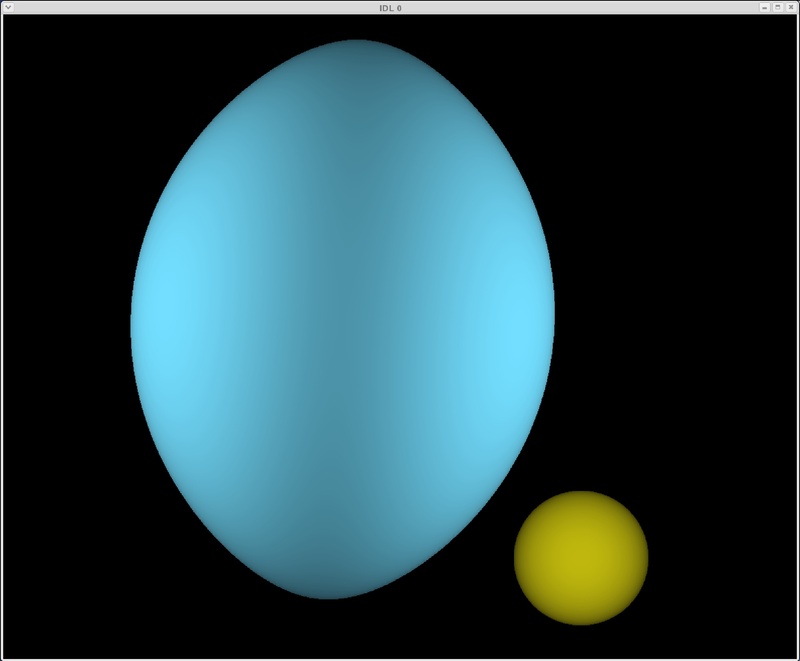 A depiction of the Algol binary RY Per (made using Rob Hynes BINSIM). See details in Barai et al. (2004, ApJ, 608, 989). Big version of RY Per (made using Rob Hynes BINSIM). See details in Barai et al. (2004, ApJ, 608, 989). 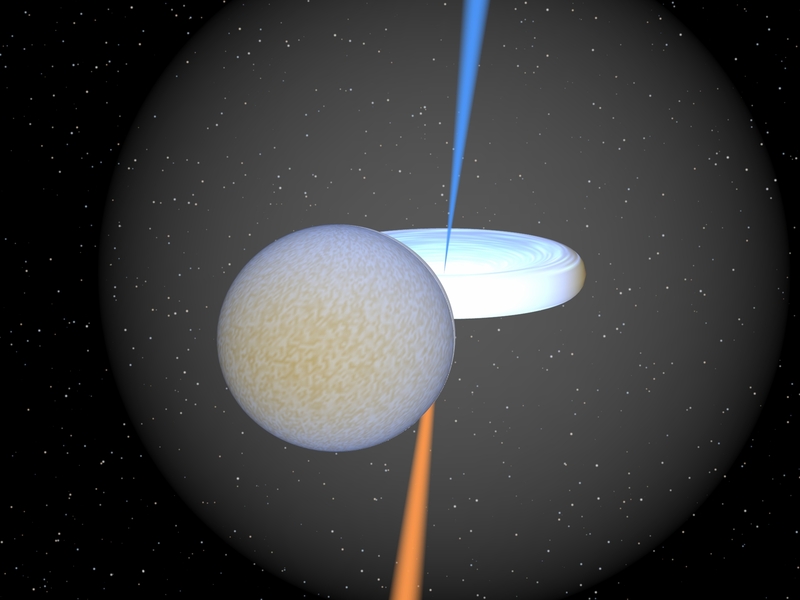 A depiction of the microquasar LS 5039 (painting by Bill Pounds). See details in McSwain et al. (2004, ApJ, 600, 927). A depiction of the Be binary Phi Per (painting by Bill Pounds). See details in Gies et al. (1998, ApJ, 493, 440). 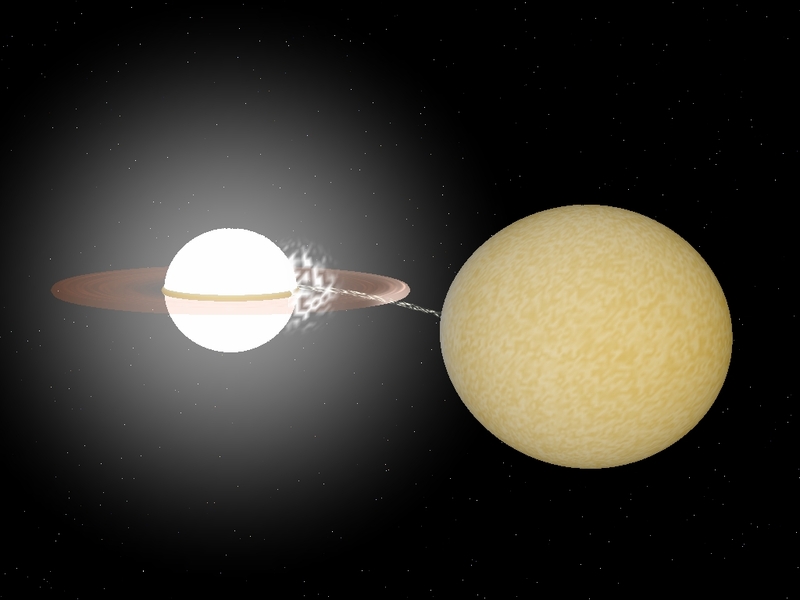 A depiction of the colliding winds binary LH54-425. See details in Sonneborn et al. (2007, American Astronomical Society Meeting 210, #03.04). An IDL software package for the separation of spectroscopic binary star spectra using the ILST Doppler tomography algorithm. A PowerPoint presentation on stellar physics topics addressed through interfermometry (presented at the NOAO Workshop on "Future Directions for Interferometry", 11-13-2006, Tucson). A PowerPoint presentation on studies of Be stars (presented at GSU Physics and Astronomy Colloquium, 11-07-2006). A PDF presentation on "Mass and Angular Momentum Transformations in Massive Binary Stars" (presented at the Georgia Tech Center for Relativistic Astrophysics Colloquium, 1-15-2009). "FGS Survey for Binaries Among the Massive Binary Stars"